I've had fun looking at all the new and different sights as I ride along. My eyes/ears are wide open taking it all in. At the same time, I'm also very conscious of standing out. When riding, it is very apparent as people take a look. Some stare, some laugh, some point and some make a comment/challenge (especially adolescent boys), some just slow down and give a good look all over. I sometimes catch eyes and get a good smile back or an encouraging "go" type look. It is very apparent that there aren't many foreigners riding a multispeed bike with red helmet, red panniers and are tall with beard and long hair. There are however, quite a few Indian bikes on the road. Standing out when riding feels better than walking, since much of the time is a positive exchange. When walking, particularly in touristy areas, I have more beggars, guide services, touts, taxi drivers or someone trying to sell me something... I stand out less walking (as typical tourist) than cycling (as moon man?) but it seems less friendly walking. I have sympathy for some of the beggars I see, but there is enough to be a bit overwhelming to keep getting accosted. This morning breakfast before I left and then southbound on the toll way (without tolls) again. The road continued flat and smooth. No more theme parks, but instead a sequence of small villages to pass through. The houses had thatched roofs. Crops of rice as well as some grains (wheat?). In some places grains were being harvested, beaten to separate hay from seed and then dried. I also saw large smoking mounds that I took to be used to make charcoal. I stopped for a few times for a drink at one of these villages. Typically I'd get a coke and a small crowd would gather looking and sometimes poking the bicycle. Traffic was less though would sometimes speed past. Twice I tried stopping to thumb through my Lonely Planet Book. It was surprising how quick someone came up to me, even though I hadn't seen anyone before I stopped. At 80 km the toll road officially ended and a few km further I passed into Pondicherry territory. This was a former French colony, but part of India since 1954. Except for some signs, policemen with red caps and some restaurants, I didn't see much French left. It got progressively busier as I rode along. I also passed along Auroville, an experimental international community with multiple small villages. Seemed intriguing though Auroville is not trying to be a tourist attracting, so I decided to continue to Pondy. The last few km into Pondy were very busy and chaotic. The city supposedly has 700,000 inhabitants so lots of crowded streets. I followed the main north/south road though that seemed to miss most hotel choices. Towards end of town, I saw a small guest house and paid Rs 150 for a room. I walked around Pondy. Multiple internet cafes here. Also nice waterfront and street. 97 km today, 26508 km cumulative. A long ride today between 6:30am departure from Pondicherry and 3:30pm when I collapsed on the bed after carrying my loaded bicycle up two flights of stairs. The tropical heat contributes as well as my timidness on figuring out what to eat along the way. I've been eating dosa, thali and other Indian foods. On the road, I fill up on bottled water and soft drink, but haven't yet figured out what to eat along the way (perhaps try biscuits and bananas). It was market day in Pondicherry, perhaps everyday, but it meant lots of bustling activity as I cycled out. It barely became rural before I came into Cuddalore at 21 km. The signage is very good outside towns, but in town I mostly rely on intuition and following main traffic flows. So far it has worked well. Outside Cuddalore it became rural again. Rice fields with many workers out. Grain (rice?) being separated from stalks and both dried. It was pleasant riding. People in the countryside would still point, stare, shout and laugh as I went past though it was friendlier than the big cities. At 71 km came Chidambaram. This is an important temple town with good accommodation. However, my early start meant it wasn't yet 11 am, so plenty more to ride. Rode through town back to the countryside and at 92 km into Sirkazhi. Some sort of demonstration going on downtown. The road was being blocked and marchers were chanting with red and white banners... I believe with hammer and sickle though I didn't wait long or start taking photos. Instead I followed the other bicycles and motorcycles quickly around the blockage. Outside town I also saw red hammer and sickle flags...but this has more of a "this road contributed by USSR" type of feel to it. After Sirkazhi, I crossed the river and onto the worst road so far. In general roads in India have been better than California (though this says more about California than India), but this one was awful. Narrow... so I kept having to get off as trucks passed, and an amazing number of potholes. At times, I just got off and walked. It was a slow slog for the next 19 km until it finally let up. What was surprising was the guide I used described this as "nothing short of superb: quiet, green and very little traffic". I was pretty tired as I came through Tarangampadi at 119 km and then slowly to Karaikal. This is part of Pondicherry district again, so alcohol was prominently available just at the border. Found a room with my three luxury items: hot water, toilet and air conditioning. Collapsed though some rice and dosa helped revive me. 133 km today, 26641 km cumulative. It took a bit of time to get breakfast before I left... it took a miscommunication or two to get food. After that the hotel waiter wished me a Happy New Year. He wanted me to buy him a new shirt (Rs 170). I exclaimed that this was a huge amount, though did end up tipping him Rs 20... about twice what I otherwise would have. Karaikal was busy as I rode through town. There was brief countryside before I reached Nagore at 12 km. The road bridge had collapsed here some time ago, but fortunately there was a small footpath built to take pedestrians, bicycles and motorcycles. I walked across and then through some bumpy roads towards Nagapattinam. The road was still occasionally very poor. At 33 km, I had my first flat, a snakebite, which means the tire gets pinched in the rim with two distinct "fang" marks. I walked my bike past a few huts and picked a quiet place to fix things. While I didn't see anyone when I started, the audience was eleven when I finished including one woman with infant. I was amused. Where I wasn't as amused is that I noticed my rear tire sidewall was ripping and starting to bulge. While I have two extra tires, if I lose two, the game is over and time to head towards Chennai. It became much more rural as I rode from the coast. In some parts very beautiful as I followed a wide river. In a few places very smooth road and also road construction involving a truck with tar and many workers. The road was rolled smooth by several workers with 55 gallon drum, probably filled with water. It was warm and I stopped a few times for water or to get a soft drink. In one spot, I found myself surrounded by over fifty children looking as I purchased and drank a sprite. Crops were still harvested with seed and grain separate by green threshing machine. As I got close, I could see a high temple for Thanjavur in the distance. A busy town, but I found a nice hotel not too far from the center. This tall temple dates from the Chola kings as this was a center for them. Walked through town and also visited the internet cafe. 107 km today, 26748 km cumulative. A rest day today. My official excuse was to visit Brihadishwara Temple and then to exchange travelers checks at 10 am when the bank opened. It was only 55 km to Trichy, so I could have cycled there but I also felt like a break after four days riding on sometimes rough roads. After deciding to stay, my GI tract decided to join in by letting me know it was getting used to India bacteria. The Brihadishwara temple was amazing! It had been built by the Chola King Raja Raja about 1010 and was dedicated to the god Shiva. The entire complex is ~110 acres and has many carved towers and temples. The tallest of these is 200 feet high. It was amazing just to walk around and see the intricate and vast carvings, paintings and temples. The temple is one of few World Heritage sites in India. I made two visits there including some time just watching the scene go by. Most of the visitors were Indian, but also some foreigners. I was accosted a few times by beggars and for guide services but much less than other temples I've been. There was an elephant here that would take a 1 Rs coin in his trunk and then place his trunk on the persons head as a blessing. 0 km today, 26748 km cumulative. It was nice to take a rest yesterday, to see the temple, to get three solid meals and to relax in the cool courtyard of Tamil Nadu Hotel and away from busy street bustle and heat on the road. Solo cycling in India is definitely challenging in different ways from my other riding this year! After four days I was ready for a break. Bank transaction went smoothly. First, to a separate "foreign exchange" office. Details of myself and passport are carefully written on a slip, in the book, on a receipt and in another ledger. I hand over travelers check signed and am given a token and told to wait outside counter #1 until I am called. Fifteen minutes later, I exchange the token for cash. I got a better rate here than in Singapore (47.7 Rs/$... in increments of 100 Rs, so don't change too much money or you end up with a large stack of bills. 100 Rs is a good denomination since I can usually "break" it and then use the 10 Rs/ 1 Rs amounts for street interactions or small tips). Today was a pleasant ride, somewhat busy leaving Thanjavur and very busy coming into Tiruchirappalli (Trichy). It helped to leave early and ride before it got too hot. Road surfaces remained variable, sometimes changing every few km. In some spots very bumpy and in others perfectly smooth. The road was usually wider, sometimes with a center divider. The last 10 km had shops along much of the way. Coming into Trichy, it became quite busy as I cycled past the old town area with narrow streets. I came past an area with large wash tubs and then into the area known as "junction" or "cantonment" with bus station and most of the hotels. A good bet for finding hotels in these towns is look close to the bus stations. Trichy had a wide range of hotels from $100+ affairs to 100 Rs guest houses. I ended up with two of my three luxuries for 400 Rs. In Trichy is a famous Rock Fort Temple. This is a high monument on a rock outcropping some 83m high. A climb of 437 steps leads up. Non-Hindus are not allowed in the temple, but it is still a nice climb with pretty views. The Rock Fort Temple is several km north of the junction, so I took an auto rickshaw for the first time. I asked about the fare, "40 Rs". I replied "30 Rs". Cab driver said, "35 Rs". I started walking away. He yelled back "30 Rs" and we were off. Wow! These streets seemed much scarier from this auto rickshaw than from my bicycle. The driver sped up, braked, swerved and tooted his horn through narrow streets filled with people and vehicles. When we stopped the meter said 70 Rs. I'm not quite certain of the fares though because on way back I asked a driver who said, "30 Rs" and I didn't haggle. This driver was much more sane and even signaled for turns! 58 km today, 26806 km cumulative. Happy Republic Day! Today celebrates the day in 1950 when India became a republic (India gained independence from the UK in 1947). Other than the calendar, I didn't notice different today than other days... though I'm not quite the one to ask about "normal" here. A pleasant ride today, cooler and mostly through rural areas. I was on the main road (NH 45), though it wasn't much different than other roads so far. There were less bumps today. The route went along the Eastern Ghats and had some gentle grades. I waited until 7 am to have a Dosai breakfast (9 Rs) and headed off. It was just a few km before the city was left behind and I was back in more rural areas. I came along areas of bananas and coconuts. I saw some grain crops, though not the larger rice fields from before. There were three or four small towns. The route bypassed middle of Manapparai at 39 km. Signs here indicated a shorter route to Madurai (100 km more). After Manapparai went through the low hills with sharp points. I've been getting used to the traffic. In the countryside it wasn't too bad. On the two lane road many buses and trucks. They would honk horns or flash lights to indicate "I'm going to pass in your lane" and I would get off the road as appropriate. There are also local bicycles and motorcycles on these roads as well as people walking, so traffic seems to anticipate obstacles on the side like bicycles (unlike US where bicycles might be more rare). At 93 km was a sign directing me to center of Dindigul. A short while later, waited for a train and then found a nice hotel with all three luxuries. Carried my bike up three flights of stairs. Walked around a bit of Dindigul. Lots of vendors out on the streets. They seem to be segregated by types with all the live chickens in one area, fruits and vegetables in another and general merchandise elsewhere. There is another rocky outpost with temple here though I didn't climb up to see it. Also several nice churches I saw from outside. Internet cafes seem to be prevalent in many of these towns. 96 km today, 26902 km cumulative. Today started with a somewhat typical interaction. The previous evening I had gone to the hotel desk with a goal in mind: to find out where I could get breakfast at 7 am. Unfortunately, my Tamil is limited to just a few words from the guide book... so we had a difficult conversation. Eventually, it seemed like it was understood "room service breakfast - 7 am". This was fine with me too, so left it at that. This morning at 7:10am, still no sign so I go down to the desk. Turns out, they had done special work to have restaurant next door preprate toast and jam. Nice!, so I eat there. After that I bring down all my gear, pack it on the bike and cycle off with waves from the staff. Pleasant and nice south Indian hospitality indeed! I think the bicycle helps, particularly after explaining I've ridden from Chennai. The road today had more traffic and also more bumpy sections. At multiple occasions I had to leave the road when cars decided to pass the other way. Sometimes frustrating. I could see the Southern Ghats though it was mostly flat. I started seeing rice fields again. Stopped once or twice for some water, but otherwise kept going. Along the way, I passed people walking on the road and dressed with green. I understand from later that these were pilgrims on way to Palani. This is an important time of year for this pilgrimage and some 200,000 come. As I got closer to Madurai, it kept getting busier. Much more of the script is in Tamil, so mostly follow main signs saying "Madurai" and as I got closer, also signs saying "Tirunelveli". After some point, it gradually became less busy and then I saw a sign for "Taj Garden Retreat". Oops. My guide book indicates this hotel is 4 km south of town. I must have ridden a bypass that went past city center. Now decision time. Either stay here (at $110/night + 35% tax... more than double my previous seven days accommodation combined has cost) and be already on my way southbound, or go back to town and find a place there. I decide to splurge, ride up the hill and stay in the fancy place for a night. It is a slow climb of 1.5 km to top of the hill with beautiful views of Madurai. After my first buffet lunch in India, I decide to go into Madurai. Costs 100 Rs by auto rickshaw. Meenakshi (Shiva's wife) is deity and protector for Madurai. The Sri Meenaskshi temple is a huge temple complex in middle of town. Cab driver brings me to the main gate and then announced, "temple is closed until 4 pm..." and brings me further in front of local handicrafts shop. On top of the shop is an observation tower. I'm not interested in a hard sell of handicrafts, so decline and go walk around town. For two hours until the temple opens, I walk around town. Many pilgrims here, many tourists and otherwise very busy. I get accosted surprisingly many times by aggressive beggars, guides, handicraft shop owners, drivers and people trying to sell me things. I find myself in a much more defensive mood... not looking, not talking and almost wanting to put up a sign: "No!, I don't need a guide, a cab ride, handicrafts. I won't give you money, please stop bothering me!" Surprising the contrast from the friendly feeling of the morning at breakfast. The Sri Meenakshi Temple is ringed by high walls and has four high towers in middle of each wall. Inside is a courtyard with a bazaar full of shops and also an interesting archaeological museum with wall paintings, carvings and statues. Also inside is a full temple. Some parts are only for Hindus, but still interesting to look around. It is surprising how open these temples actually are to us tourists. Unfortunately, I'm certain I'm missing a bunch (and wasn't in a mood to find and negotiate with a guide). After visiting the temple, found an auto rickshaw and ride back to the fancy hotel. In the evening a beautiful view of lights on the city. 66 km today, 26968 km cumulative. Today was well set up for a longer ride. It started overcast, so cooler. The restaurant opened at 6:30am, half an hour earlier than normal. Several nice buffet meals to regain some nourishment. The road surface was smooth with just a few multi-km bumpy sections. I rode down the hill for the first km and then back onto the main track. Pilgrims were walking along this road for the next 2 km. Traffic was heavy, but gradually got lighter as I got further from Madurai. Several smaller towns to pass through today. The first was Tirumangalam at 20 km. Different crops, I saw something that looked like a cross between wheat and corn. Also some sections without crops, just bushes about 2m tall. More goat herders here as well. I also saw large bags filled with husks or something. Several nice stops to get water and biscuits. Still curious onlookers. The most common question is "What is your native place?" After that the curiosity seems to be about the bike, particularly the gearing, odometer and extra tires. Much less curiosity about where I'm riding to/from than in Australia. Followed the bypasses past Virdunagar at 45 km, Sathur at 70 km and Kovilpatti at 93 km. Saw a roadside motel at 116 km, first time I've been seeing accommodation outside the towns. The sun was coming out and it was getting hot, but decided to push on to Tirunelveli. Came past a large cement plant and it was busier traffic after that. The last few km winded into middle of a busy town. Found a nice hotel right downtown (thanks Srini!) and relaxed after a long ride. 150 km today, 27118 km cumulative. Made it to the tip of India! They say this is one of few spots where you can see the sun set and moon rise both over the ocean and both at the same time. Had a good breakfast at Janikiram Hotel and also some hadwi sweets from the sweet stand before leaving. It was busy leaving the center of Tirunelveli but peaceful and quiet not soon after I was on the southbound road again. Saw many more rice fields today. The route passed closer to the Ghats again with jagged edges visible. A few small towns, but also lots of countryside. Taller trees along the way, which was welcome in a bright and hot sun. At 60 km started a section with many many wind turbines. There were multiple companies, each with their own signs, so not certain of how much power, but one says 13 megawatts of power generated. A tailwind and endpoint in mind meant I made good progress and was in Kanyakumari in time for a late lunch. Many hotels here, so found a reasonable one and checked in for two nights. Kanyakumari is an interesting town to walk around. Many pilgrims here and many tourists (mostly Indian but some foreigners). 83 km today, 27201 km cumulative. A day to look around Kanyakumari including the Kumari Amman Temple, Ghandi Memorial and Vivekananda memorials. Also fun walking through streets of this tourist and holy town. There are many small stalls here selling shells, silks, foods, nuts and grains, cameras, toys, plastic stuff and many odds and ends. For those who buy enough, there are several shops selling luggage. The equivalent of the US "dollar shop" or the Australian "2$ Shop" is here with places where everything is priced at 10 Rs or at 20 Rs. In many of the shop areas, no vehicles are allowed so more pleasant than walking through town centers in the larger cities. There seem to be fewer aggressive sales people here. Had fun walking through the crowded shops last night. The Kumari Amman Temple is dedicated to Devi and her sacrifices. It is smaller than the giant temples in Madurai and Thanjavur. Men remove shirts before going in. There is an inner area for Hindus only, but other parts were interesting. Swami Vivekananda was a wandering philosopher who taught at end of the 19th century. There is a small museum here with 41 informative panels that provide a story of his travels and some of his teachings. He came to Kanyamumari in late 1892 and meditated on rock islands just offshore. Two large memorials have been built there now and there is small ferry to take tourists. I too looked around. Things out of place can seem funny. Coming back from the Vivekanda memorial on the islands, noticed when I stood under the low awning, some giggling. Apparently my height was amusing to others in line... someone so tall. I was also amused, looked back and smiled and caused them to become more self-conscious. Mahatma Ghandi's ashes were stored at Kanyakumari before being spread at sea. A large memorial is here. It has a small hole in precise spot so that on October 2nd (Ghandi's birthday), the sun strikes the internment site. Also here is a nice sequence of photos of Ghandi's life. There was a nice lighthouse and a small government museum. I skipped the museum though. Instead, I escaped afternoon heat in cooler internet cafe and otherwise relaxed on this tip of India. My bike tire is sticking out a bunch more, so may swap it for the spare tonight. 0 km today, 27201 km cumulative. I've now ridden in fifty states and that doesn't count Utah or Arkansas. Six of these states are in Australia and two of them are in India after I crossed from Tamil Nadu to Kerala. Slower cycling today as the route passed through a sequence of towns, the entire route was built up. Also more gradual grades as the road climbed and descended. Several sections were very bumpy including at Nagarcoil at 18 km. Left Kanyakumari after breakfast and headed north again, against a light cross wind. Nice scenery with rice fields and small canal. Crossed a few narrow bridges before Nagarcoil. I came past Padmanbhapuram with an old fort, though didn't stop. Mostly kept slowly going under a hot sun. It was tough to tell the names of villages since they all blended together and many names were in script. 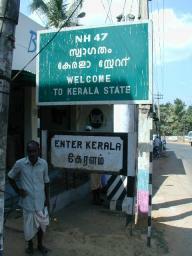 I was happy to see the Kerala sign after 50 km. Yeah! At 72 km was turnoff and then a worse bumpy road towards the coast. More descents though still slow riding. Finally came into the hills over Kovalam. Found a hotel nearby and asked about room prices. ~2795 Rs. Wow! I said I was looking for a place closer to ~1000-1200 range and turned away. Surprisingly they came back and said they would do it for 1300 Rs. Still about twice what I'd otherwise paid, but also a very nice room. Walked around Kovalam after that. Kovalam is an interesting resort area mostly for foreigners. Apparently some fly here from Europe for a week of "sanitized India". There is a long beach with sidewalk running alongside. Behind the sidewalk, many restaurants and shops. Behind the restaurants many different hotels and lodges. Almost entirely foreign tourists. In the evening many of the restaurants had fish proudly displayed so you could see what you were eating. Offshore there were lights from fishing vessels. 85 km today, 27286 km cumulative.